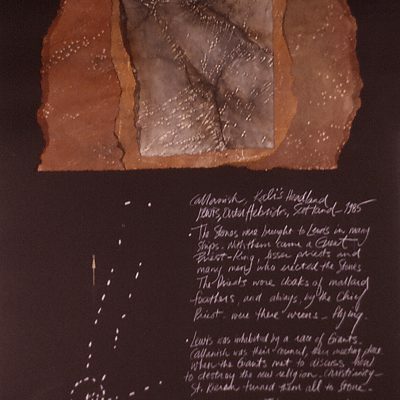 —Excerpt from Artist’s Statement, in the catalogue for Worshipping the Stone. 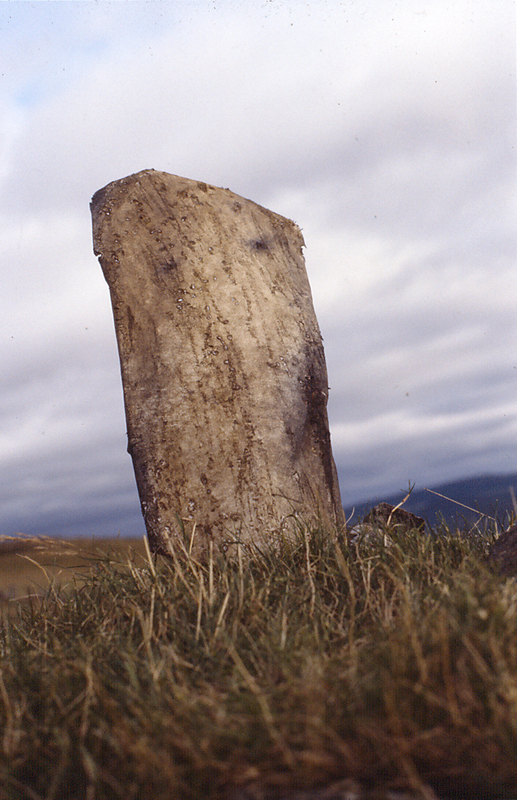 In 1985 Hall returned to Northern Scotland to develop a body of work investigating the sacred stone sites of the region and speculating on the power of stone and the places it marked. There were deep similarities, she suspected, between the power of those places, and the power she experienced in the Newfoundland landscape. 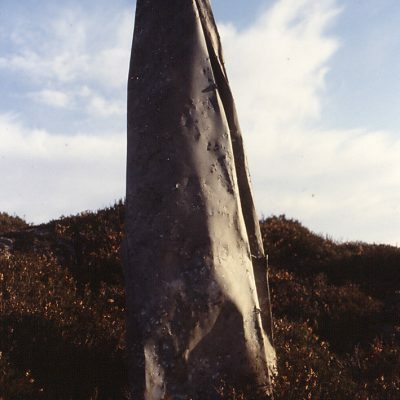 During the three months she was there, she visited megalithic sites on the Orkney Islands, the Outer Hebrides, and throughout Northern Scotland. 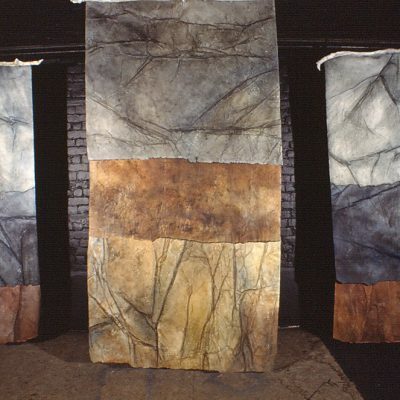 Pounding marks and scars into heavy rag paper (sometimes backed with muslin), then staining it with dry pigments and water and grease, she created a large series of works in which the process of making was in many ways more important to the artist than the products which emerged. Arduous, repetitive, deeply physical – it was a ritual like grinding corn, like prayer. 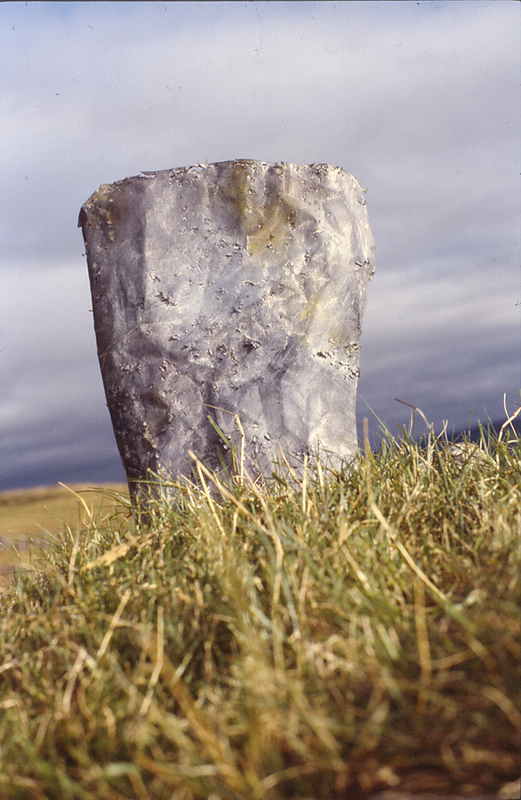 The first small outdoor installations in her career took place in the Scottish Highlands, north of Inverness. 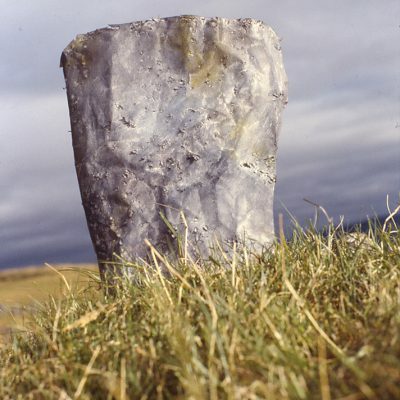 Some of the works were made on site by rubbing paper against stone, and she brought a small stone back with her from a beach on the Isle of Lewis, and used it to mark the works she constructed in her studio there. 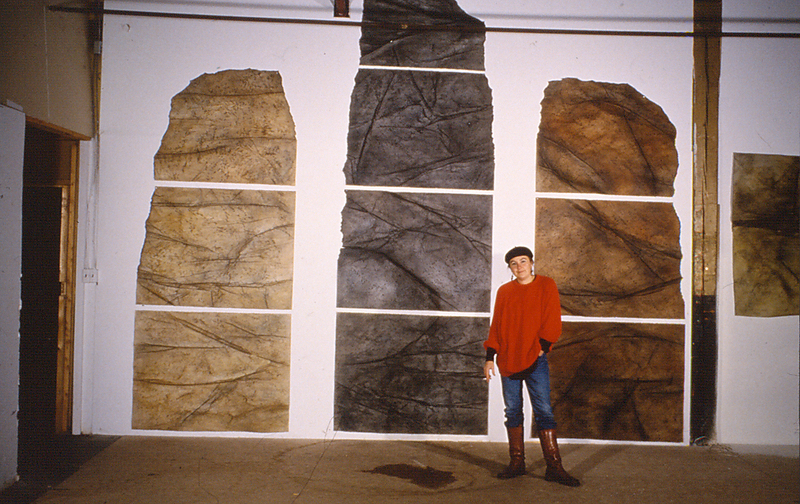 Hall in her St. John’s studio with The Stone Puzzle, in progress. 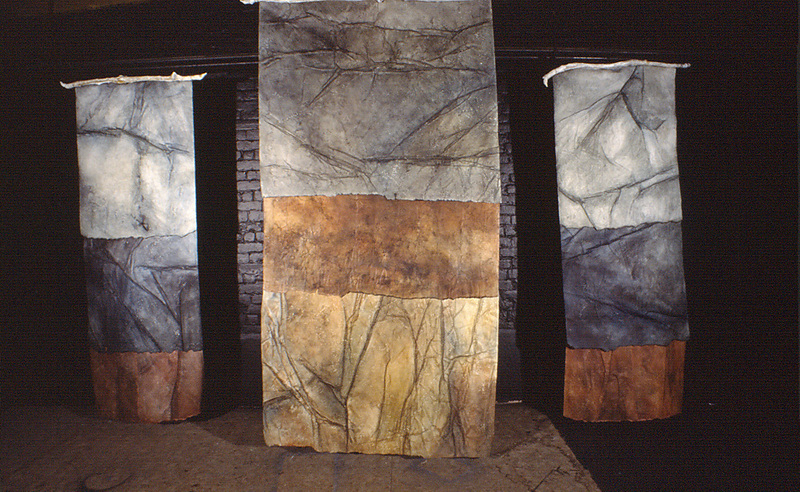 When complete, it included a freestanding paper and fibreglass stone situated about 18″ in front of the middle three panels. 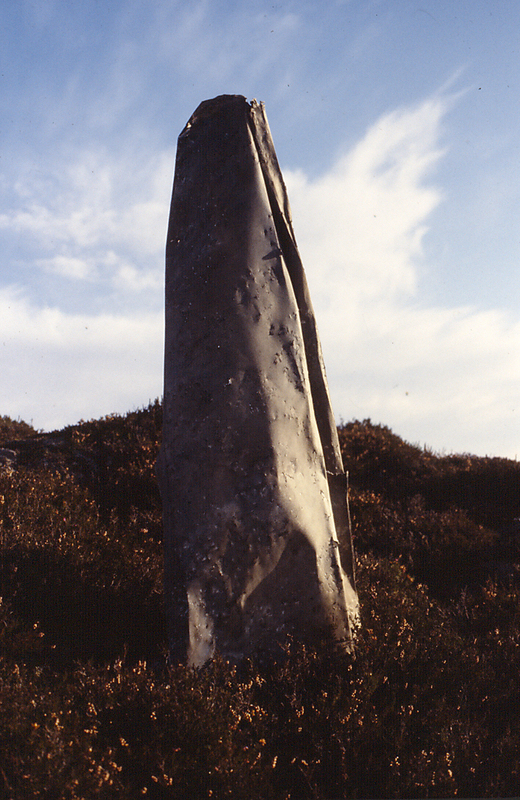 The piece is 14.5 feet tall, 13 feet 8 in wide, and the freestanding stone was approx 8′6″ tall. 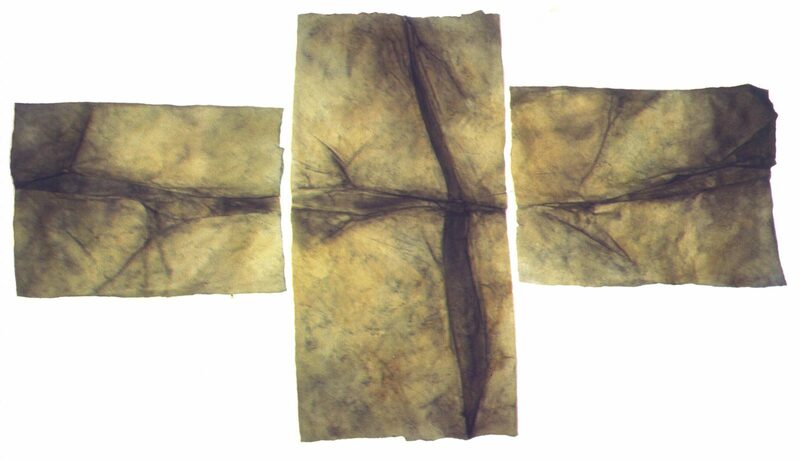 This work was presented to the public at Memorial University Art Gallery, in St. John’s, in 1987, and in 1988 at Mount St. Vincent University in Halifax, N.S. 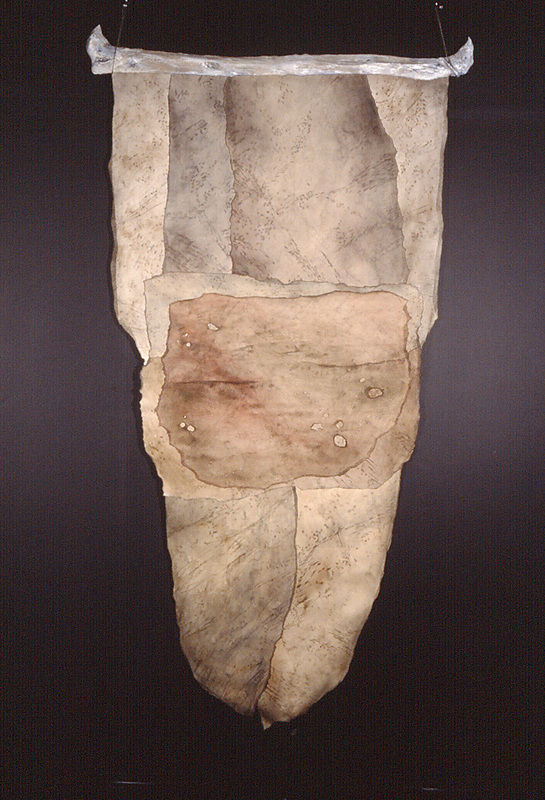 The artist gratefully acknowledges the support of The Canada Council for the Arts in the creation of this work. 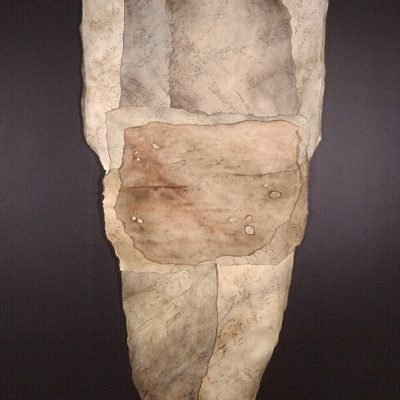 The catalogue of this exhbition contains an introduction by Patricia Grattan, and is available by contacting the artist. 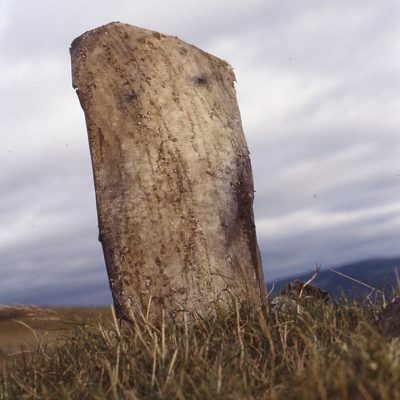 The Callanish Diaries emerged as memoirs – notes of her encounters at the sacred site of The Stones of Callanish, on the island of Lewis in the Outer Hebrides – a megalithic site about the age of Stonehenge. These works were foundational in the visual language Hall would develop later – incorporating text, schema, and visual elements, and in adopting the format of a “page” and journal. 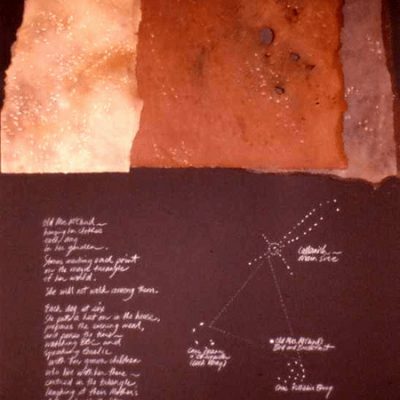 There were 7 “pages” in Volume I of the Diaries, all 30″×40″, mixed media on black Arches paper. Three are presented below. 1987. Catalogue for an exhibition at Memorial University Art Gallery, 1987. 1988–1993. The Coil began her life as a cod-trap – a fishing net which had hauled thousands of pounds of fish ashore, and was beyond mending. 1993 and 2005. 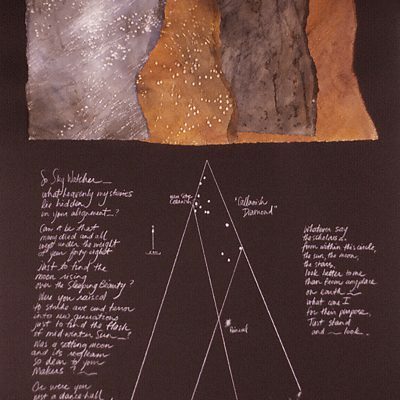 Two series of bookworks constructed from old artworks, hand-made paper, and small scraps of beach detritus. 1987. A 28-day cycle of daily drawings on black paper.